SWBAT identify equal and unequal parts (or shares) in two-dimensional shapes. Equal Schmequal! In this lesson students will examine the parts of a shape and determine if they are equal or unequal. I begin this lesson by reading aloud, “Equal Schmequal”. This story is highly engaging for students and begins to build the vocabulary for equal and unequal. After reading the story, I draw a circle on the board and ask a student to draw a line to show two parts. I then draw a trapezoid, and invite a different student to draw a line to show two triangles. 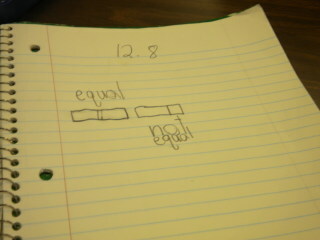 Finally, draw a rectangle, and have another student draw a line to show two squares. Reinforce that the lines drawn show parts of the shapes. A real-life situation for this concept is sharing food. Circular shapes (pizzas or cookies), rectangular shapes (candy bars or graham crackers), or pieces that are part of a group (M&Ms or cheerios) could be used to show students how to divide into equal parts so that everyone can have the same size piece. Deciding whether a shape (or a whole) has been partitioned into equal or unequal parts is the beginning of children’s experience with fractions (1.G.A.3). You'll see in the next section that this approach helps children begin to develop a conceptual basis for understanding fractions. To help the students visualize equal shares, I hand out play-doh to each student. I instruct them to make a circle with their play-doh. I then tell them to pretend their circle is a cookie and ask them how they would share it with their friend. 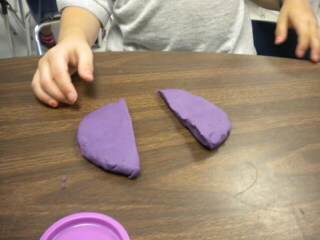 I then have students cut or break their play-doh cookie. I then have them place the pieces on top of each other and have them discuss with their shoulder partner whether they are equal or unequal shares. After discussing equal shares with play-doh, I hand each student 10 connecting cubes. I instruct them to put their connecting cubes into a cube train that has the same number of cubes. This is another concrete example that will allow students to visualize that equal shares means that they are the same size or same number. Draw a line to show two triangles in the square. Draw lines to show three triangles in the square. As I lead children through this process, I am guiding them to understand that the three triangles will not all be the same size. How can you draw three triangles in a different way? Finally, I allow volunteers to show any different ways they made triangles. I work through the example on the top of the Equal Parts_worksheet.docx with children to connect the vocabulary terms to the shapes shown. I read the question in the cloud and invite children to share their answers. I then release students to complete the worksheet on their own. To close out the lesson, I have students draw 2 rectangles in their math journal. I then instruct them to divide one rectangle into equal shares and the other into unequal shares.